Decoration 143 historiated initials in colours, gold, and silver, with full borders, at the beginnings of biblical books and prologues and 1 miniature in the margin (f. 192v). 23 large foliate initials in colours and gold, with full borders, at the beginning of additional prologues, and smaller foliate initials in colours and gold with foliate marginal extensions, at the beginning of chapters. 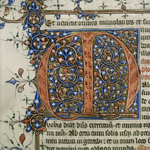 Initials in red with blue or purple pen-flourishing, or in blue with red pen-flourishing (ff. 1v, 143-158, 323-350). Line-fillers in red and blue, running titles and chapter numbers in blue. First letters of verses highlighted in yellow; pen-flourished descenders, sometimes with profile heads (e. g., ff. 35, 42v-43). Catchwords in decorated scrolls (e.g., ff. 81v, 297v), sometimes with drawings of human heads or hybrids (e.g., ff. 105v, 129v, 137v). Binding BM/BL in-house. Rebound in 1978. Provenance Perhaps illuminated by Herman Scheerre: an inscription 'Omnia leuia sunt amanti' (f. 229) considered as Herman Scheerre's motto.
? Henry IV [known as Henry Bolingbroke] (b. 1366, d.1413), king of England and lord of Ireland, and duke of Aquitaine, perhaps to be identified with a 'magna Biblia' referred to in Henry V's last will of 10 June 1421, which was deposited by Henry IV in the Bridgettine monastery at Syon and was meant to be returned to the unborn child of the king (see Stratford 1994, and Wright 1992 and 1995).
? Henry V (b. 1386/7, d. 1422), king of England and lord of Ireland, and duke of Aquitaine: perhaps the magna Biblia mentioned in his will (see above]. Henry VI (b. 1421, d. 1471), king of England and lord of Ireland, and duke of Aquitaine: perhaps the magna Biblia mentioned inherited from his father, Henry V (see above]. The Old Royal Library (the English Royal Library): perhaps to be identified with the 'Biblia magna' in the list of books at Richmond palace of 1535 (see Carley 2000). Includes the Gospel of Nicodemus entitled 'Tractatus passionis Christi secundum Nichodemum' (ff. 282-286v), the Interpretation of Hebrew names (ff. 323-337v), and capitula of the Bible (ff. 338-350). Hand G (ff. 209, 291, 297v, 301, 301v, 302), Hand H (ff. 315v, 316v, 317v, 318, 318v). Also known as the Bible of Richard II, but Richard's ownership questioned by Krochalis 1988 and Scott 1996 on chronological evidence. Low German of Flemish inscriptions in the background and in the frame of two miniatures (ff. 126v?, 145) and a French inscription in the background of the miniature (f. 229); pointing hand (manicula) (f. 159). Instructions for illuminators reading 'doctor' next to historiated initials of Jerome (ff. 221v, 229, 233, 234v, 237, 239v, 262, 267, 275v, 287). Catchwords and bifolium signatures. Select bibliography Walter de Gray Birch and Henry Jenner, Early Drawings and Illuminations: An Introduction to the Study of Illustrated Manuscripts (London: Bagster and Sons, 1879), p. 11. E. M. Thompson, English Illuminated Manuscripts (London, 1895), pp. 58-61, pls. 18-19. G. F. Warner, Illuminated Manuscripts in the British Museum, 10 (London, 1903), pls. 41-42. G. F. Warner, Reproductions from Illuminated Manuscripts, 3 (London, 1910), pl. xxvii. J. A. Herbert, Illuminated Manuscripts (London: Methuen, 1911), pp. 232-33. George F. Warner and Julius P. Gilson, Catalogue of Western Manuscripts in the Old Royal and King’s Collections, 4 vols (London: British Museum, 1921), I, pp. xi, no. 3, 21-22. Schools of Illumination: Reproductions from Manuscripts in the British Museum, 6 vols (London: British Museum, 1914-1930), IV: English A.D. 1350 to 1400 (1922), pls. 4-5 . British Museum: Reproductions from Illuminated Manuscripts, Series 3, 3rd edn, ed. by J. A. Herbert (London: British Museum, 1925), pl. 17. Eric G. Millar, English Illuminated Manuscripts of the XIVth and XVth Century (Paris: Van Oest, 1928), pp. 31-32, 69-70, 87, pls. 74-78. Elfrida O. Saunders, English Illumination, 2 vols. (Florence: Pantheon, 1928), I, pp. 110-11, 113, 115, II, pls. 119-21. Elfrida O. Saunders, A History of English Art in the Middle Ages (Oxford: Clarendon Press, 1932), p. 149. Guide to an Exhibition of English Art Gathered from Various Departments and Held in the Prints and Drawings Gallery (London: British Museum, 1934), no. 127. Margaret Rickert, 'Herman the Illuminator', Burlington Magazine, 46 (1935), 39-40 (p. 40). Frederik Harrison, English Manuscripts of the Fourteenth Century (c. 1250 to 1400) (London: Studio Publications, 1937), pp. 27-28, pl. 19. Charles L. Kuhn, 'Herman Scheerre and English Illumination of the Early Fifteenth Century', The Art Bulletin, 22 (1940), 138-56 (pp. 139-40, 150-51, figs. 24-26). E. Rickert, in J. M. Manly, and E. Rickert, The Text of the Canterbury Tales: Studied on the Basis of All Known Manuscripts, (Chicago: University of Chicago Press, 1940), I, pp. 567, 569, 584. Chaucer's World, ed. by C. C. Olson, M. M. Crow and E. Rickert (London: Oxford University Press, 1948), p. 138. J. Evans, English Art 1307-1461, Oxford History of English Art, 5 (Oxford, 1949), p. 98, pl. 48b. Margaret Rickert, The Reconstructed Carmelite Missal: An English Manuscript of the late XIV century in the British Museum, Additional 29704-5, 44892 (London: Faber & Faber, 1952), pp. 17, 94-96, pls. LIIb, LIIIc, LV. G. M. Spriggs, 'Unnoticed Bodleian Manuscripts, Illuminated by Herman Scheerre and his School', The Bodleian Library Record, 7 (1964), 193-203 (pp. 194 n. 1, 198, pl. XIb). Margaret Rickert, Painting in Britain: the Middle Ages, 2nd edn (London: Penguin Books, 1965), pp. 171-72, pls. 170(A), 174. G. Mathew, The Court of Richard II (London: John Murray, 1968), p. 43. D. J. Gifford, 'Iconographical Notes towards a Definition of the Medieval Fool', Journal of the Warburg and Courtauld Institutes, 37 (1974), 336-42 (p. 337). G. M. Spriggs, 'The Nevill Hours and the School of Herman Scheerre', Journal of the Warburg and Courtauld Institutes, 37 (1974), 104-30 (pp. 116, 118, 120). Janet Backhouse, 'An Illuminator's Sketchbook', The British Library Journal, 1 (1975), 3-14 (p. 13 n. 5). J. J. G. Alexander, The Decorated Letter (New York: G. Braziller, 1978), p. 18, fig. XVI. W. P. Yapp, 'The Birds of English Medieval Manuscripts', Journal of Medieval History, 5 (1979), 315-48 (p. 342). W. B. Yapp, Birds in Medieval Manuscripts (London: British Library, 1981), p. 154, fig. 50. J. J. G. Alexander, 'Painting and Manuscript Illumination for Royal Patrons in the Later Middle Ages', ed. by V. J. Scattergood and J. W. Sherborne, English Court Culture in the Later Middle Ages (London: Duckworth, 1983), pp. 141-62 (p. 147 n. 22). V. A. Kolve, Chaucer and the Imagery of Narrative (Stanford: Edward Arnold, 1984), pp. 488 n. 39, 493 n. 78. A. Simpson, The Connections between English and Bohemian Painting during the Second Half of the Fourteenth Century, Outstanding Thesis from the Courtauld Institute of Art (New York, 1984), p. 159. J. E. Krochalis, 'The Books and Reading of Henry V and his Circle', The Chaucer Review, 23 (1988), 49-77 (p. 58). Sylvia Wright, 'The Big Bible Royal 1 E IX in the British Library and Manuscript Illumination in London in the Early Fifteenth Century', unpublished doctoral dissertation, University of London 1986. Kathleen L. Scott, 'Design, Decoration and Illustration', ed. by J. Griffiths and D. Pearsall, Book Production and Publishing in Britain 1375-1475 (Cambridge: Cambridge University Press, 1989), pp. 31-64 (pp. 58 n. 44, 61 n. 77, 64 n. 119). C. Paul Christianson, 'Evidence for the Study of London's Late Medieval Manuscript-Book Trade', ed. by J. Griffiths and D. Pearsall, Book Production and Publishing in Britain 1375-1475 (Cambridge: Cambridge University Press, 1989), pp. 87-108 (p. 108 n. 44). A. F. Sutton and V. Visser-Fuchs, The Hours of Richard III (Stroud: Alan Sutton for Richard III & Yorkist History Trust, 1990), pp. 37, 87 n. 28, 92 n. 77, 93 n. 95. Sylvia Wright, 'The Author Portraits in the Bedford Psalter-Hours: Gower, Chaucer and Hoccleve', British Library Journal, 18 (1992), 190-202 (p. 192). Jenny Stratford, 'The Royal Library in England before the Reign of Edward IV', in England in the Fifteenth Century: Proceedings of the 1992 Harlaxton Symposium, ed. by. Nicholas Rogers, Harlaxton Medieval Studies, 4 (Stamford: Paul Watkins, 1994) pp. 187-97 (pp. 193-94). Sylvia Wright, 'Bruges Artists in London: The Patronage of the House of Lancaster', in Flanders in a European Perspective: Manuscript Illumination around 1400, Flanders and Abroad: Proceedings of the International Colloquium, Leuven, 7-10 September 1993, ed. by Maurits Smeyers and Bert Cardon (Leuven, 1995), 93-109 (pp. 93, 98-99, 100-01, figs. 5-6). 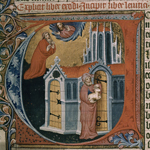 Susie Vertongen, 'Herman Scheerre, The Beaufort Master and the Flemish Miniature Painting: A Reopened Dabate', in Flanders in a European Perspective: Manuscript Illumination around 1400, Flanders and Abroad: Proceedings of the International Colloquium, Leuven, 7-10 September 1993, ed. by Maurits Smeyers and Bert Cardon (Leuven, 1995), 251-65 (pp. 255-57). Kathleen L. Scott, Later Gothic Manuscripts 1390-1490, A Survey of Manuscripts Illuminated in the British Isles, 6, 2 vols (London: Harvey Miller, 1996), no. 26, I, 35, 39, 40, 43, 2, 65 ns. 2, 4, 70 n. 5, 73 n. 37, 75 n. 52, 76 n. 14; II, 28, 36, 43, 63, 70-71, 75, 79, 94, 98, 100, 107-13, 130, 135, 148, 156, 158, 168, 170, 174, 268, 344, Table I, figs 109-115, 117. Janet Backhouse, The Illuminated Page: Ten Centuries of Manuscript Painting in the British Library (Toronto: University of Toronto Press, 1997), no. 133. Maurits Smeyers, Flemish Miniatures from the 8th to the mid-16th Century (Leuven: Brepols, 1999), pp. 187, 188, 228, pl. 15 on p. 188. Jenny Stratford, ‘The Early Royal Collections and the Royal Library to 1461’, in The Cambridge History of the Book in Britain, 6 vols (Cambridge: University Press, 1999-2011), III: 1400-1557, ed. by Lotte Hellinga and J. B. Trapp (1999) pp. 255-66 (p. 263). The Libraries of King Henry VIII, ed. by J. P. Charley, Corpus of British Medieval Library Catalogues, 7 (London: The British Library, 2000), H1.21, p. xxiv. Christopher de Hamel, The British Library Guide to Manuscript Illumination: History and Techniques (London: British Library, 2001), pl. 35. Scot McKendrick and Kathleen Doyle, Bible Manuscripts: 1400 Years of Scribes and Scripture (London: British Library, 2007), p. 144, fig. 130. Kathleen L. Scott, Tradition and Innovation in Later Medieval English Manuscripts (London: British Library, 2007), pp. 37, 52, 98, fig. 51. Royal Manuscripts: The Genius of Illumination (London: British Library, 2011), no. 23.